At a time when women were generally excluded from scholarly discourse in the intellectual centers of Europe, four extraordinary female letterate proved their parity as they lectured in prominent scientific and literary academies and published in respected journals. 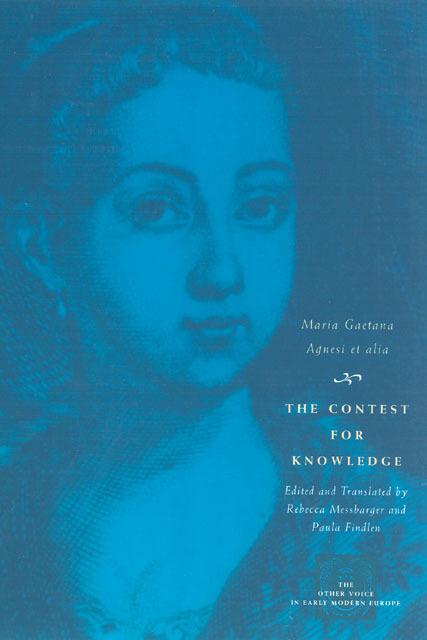 During the Italian Enlightenment, Maria Gaetana Agnesi, Giuseppa Eleonora Barbapiccola, Diamante Medaglia Faini, and Aretafila Savini de’ Rossi were afforded unprecedented deference in academic debates and epitomized the increasing ability of women to influence public discourse. The Contest for Knowledge reveals how these four women used the methods and themes of their male counterparts to add their voices to the vigorous and prolific debate over the education of women during the eighteenth century. In the texts gathered here, the women discuss the issues they themselves thought most urgent for the equality of women in Italian society specifically and in European culture more broadly. Their thoughts on this important subject reveal how crucial the eighteenth century was in the long history of debates about women in the academy.